Representation of the spin vectors of the liquid helium as they form half quantum vortices. For the first time, researchers have documented the long-predicted occurrence of 'walls bound by strings' in superfluid helium-3. The existence of such an object, originally foreseen by cosmology theorists, may help explaining how the universe cooled down after the Big Bang. With the newfound ability to recreate these structures in the lab, earth-based scientists finally have a way to study some of the possible scenarios that might have taken place in the early universe more closely. The findings came after two successive symmetry-breaking phase transitions at Aalto University's Low Temperature Laboratory. Helium stays a liquid at atmospheric pressure even when chilled down to absolute zero, at which all other materials freeze solid. Not only does helium remain fluid at cryogenic temperatures, but it becomes a superfluid at a sufficiently low temperature. 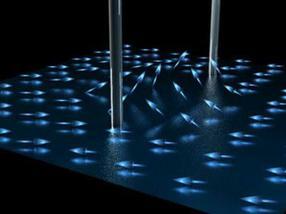 A superfluid material has essentially zero viscosity, which means it should flow forever without losing energy. When confined to a nano-structured volume, researchers can use superfluid phases of the isotope helium-3 to study effects like half-quantum vortices--whirlpools in the superfluid where the amount of helium flowing is strictly controlled by the rules of quantum physics. 'We initially thought that the half-quantum vortices would disappear when we lowered the temperature. It turns out that they [half-quantum vortices] actually survive as the helium-3 sample is cooled below half a millikelvin--instead a nontopological wall appears,' says Jere Mäkinen, lead author of the study and doctoral student at Aalto University. While not physical walls, which would block flow, the nontopological walls alter the magnetic properties of helium. The researchers were able to detect the changes using nuclear magnetic resonance. In the first few microseconds after the Big Bang, some cosmologists believe the entire universe experienced symmetry-breaking phase transitions, like a superfluid inside a nano-structured volume as it is chilled. The theory goes that quantum fluctuations or topological defects, like domain walls and quantum vortices, in the ultra-condensed universe were frozen in place as the universe expanded. With time these frozen fluctuations became the galaxies that we see, and live in, today. Being able to create these objects in the lab may allow us to understand more about the universe and why it formed in the way it did. As an added bonus, the structure of these hurricane-like defects Mäkinen created in the laboratory also provides a potential model for the study of topological quantum computing. 'While liquid helium-3 would be too hard and expensive to maintain as a material for a working computer, it give us a working model to study phenomena that could be used in more accessible future materials,' he says.